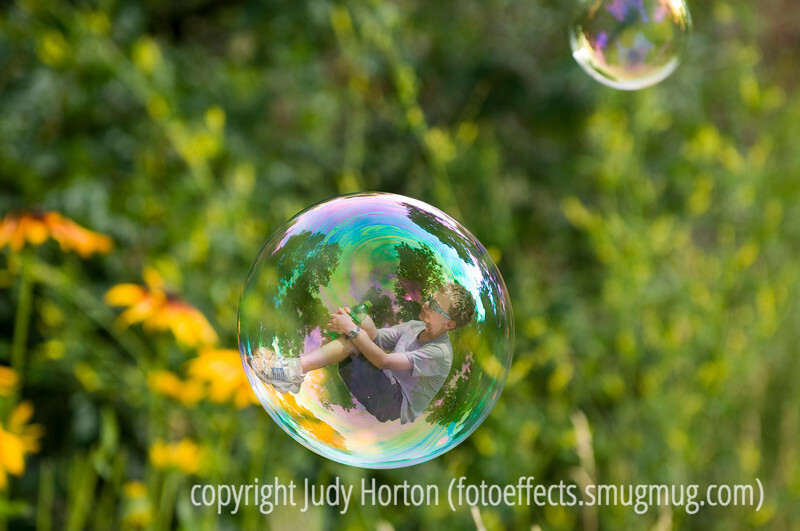 "The Boy in the Bubble" - song by Paul Simon. This is the redone version of this. I took a new photo of a bubble and, instead of cutting out the bubble and putting it on a different background, this time I kept the bubble and the background intact. All I did was add the boy. If you look at it in the largest sizes, you'll see the reflections in the bubble now reflect the actual setting in which it was taken --- although you'll see the pine trees in my garden, which do not actually show in the background itself. You can also see that there are reflections both in front of and behind the boy. Having done all that, I'm not sure this is really that great an image. The boy does not pop out at you. You have to look carefully for him. However, I think this may be about as good a job as I can do on this idea. I'd appreciate your thoughts regarding whether I should enter this or the great balls of fire shot that I posted on the dailies two days ago. Thanks, as always, for your comments, which I value a lot. I did learn quite a bit doing this little project and that, of course, is never wasted effort. Have a great day everyone! My hubby and I are going up to Denver to help our daughter put up drywall in her new ballet studio. Fantastic image, and thank you for the background info. on how you edited this creative photo! This draws my eye directly to the bubble. Very creative work! The idea is very good. You could make other attempts with the figure inside, but it cannot pop-up too much as it is supposed to be something ethereal. Hi, Wow this is great.